A clear matt finish for interior concrete, masonry or timber. Use on internal walls and ceilings for the uncoated natural look. Complies with the Green Building Council Australia: Green Star – Office Design v3 & Office As Built, Table IEQ-13.1 Maximum TVOC Content Limits for Paints, Varnishes and Protective Coatings. 2-4 hours touch dry. 6 hours Recoat. (In cooler or humid drying times will be longer. Drying time us affected by wet film thickness (WFT), the higher the WTF the slower the rate of reaction and the longer the dry time). Concrete should be dry and free from any surface contamination such as laitance or efflorescence. It must not be used if there is any evidence of bond breakers or oil. For best results, maximum penetration should be achieved with the first coat. If subsequent coats are required they should be applied as thin finishing coats. Check by applying a small amount (3mL) to the surface, if it is absorbed apply another coat, if it sits on the surface or beads the surface is sealed. Spraying: Airless spray recommended. Use a 0.33 to 0.38mm (13 – 15 thou) orifice, 10cm fan (dependent on job) with a regulated pump pressure of 350-400 kPa (50 – 55 psi) tip pressure. Back brushing is recommended to achieve an even finish. Use normal protection i.e. mask, overalls. Watch your overspray. Wash off with soap and water before it dries. 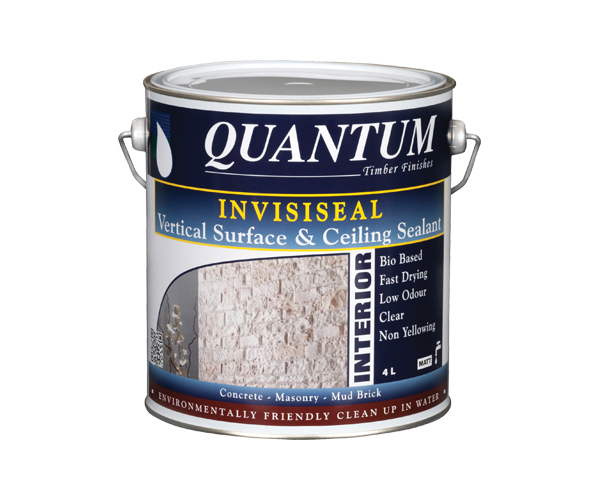 Interior vertical surfaces and ceilings of porous substrates such as concrete, masonry, mud brick and timber - ceilings, under cover soffits and facia, where a clear matt finish is required. Not suitable for high traffic areas and hard steel trowelled, non-absorbent concrete.